The first edition of this directory was published some 20 years ago. Since then, many changes have taken place in the systematics of this group, with numerous new species having been described, and new synonymies and keys published, bearing witness to the vitality of freshwater copepod systematics. The families treated are the Oithonidae (with subfamilies Oithoninae & Limnoithoninae), Cyclopinidae, Cyclopettidae, and Cyclopidae, the most widely distributed family in inland waters (with subfamilies Euryteinae, Halicyclopinae, Eucyclopinae, and Cyclopinae). 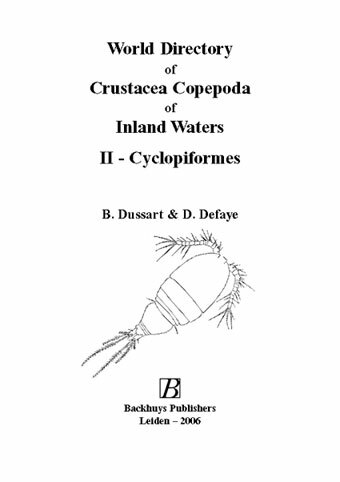 As in the previous edition (World Directory of Crustacea Copepoda of Inland Waters I - Calaniformes) the references cited in the taxonomic part are given in alphabetical order, and the abbreviations of the references follow the ISO-4 standards (ISDS, 1985 and following years). The scientific index includes the synonyms in roman characters, which allows the reader to follow the trail of any citation to its present valid name. 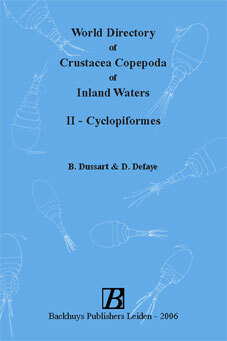 This will be a standard reference work for all those involved in copepod research.